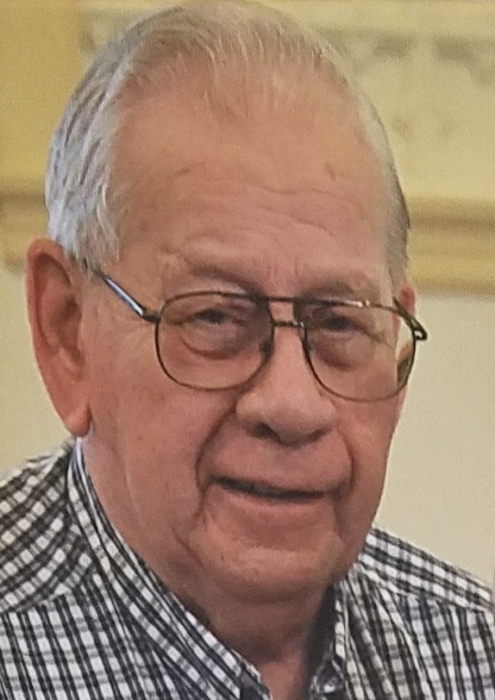 Obituary for Jim Peterson | Esterdahl Mortuary and Crematory, Ltd.
James Leroy Peterson, 85, of Lynn Center, died Sunday, October 28, 2018, at Seminary Manor, Galesburg. Funeral services will be held at 10:30 a.m., Friday, November 2, 2018, at Augustana Lutheran Church, Andover. Visitation will be from 4-7 p.m., Thursday, at Kirk, Huggins & Esterdahl Funeral Home, Ltd., Orion. Burial will be at the Rock Island National Cemetery. Memorials may be made to Augustana Lutheran Church, the Orion Fire Department or to the Oxford Fire Department. Jim was born on July 9, 1933, in Moline, the son of Richard and Hazel (Peterson) Peterson. He married Delois Jean Sandridge on June 23, 1956, in McGaheysville, VA.
Jim was a 1952 graduate of Orion High School. He was a U.S. Navy veteran serving 4 years on the USS Mellette APA 156 and founder and organizer of the ship reunion for 20 years. He was a member of the Ophiem American Legion Post 1077. He was a member of the Augustana Lutheran Church and Moline Viking Club. He had retired from the Moline Post Office in 1988, after 30 years and belonged to the Moline Post Office Letter Carrier Retirees. He enjoyed watching sports, especially the Cubs and the Bears. He loved attending his children’s and grandchildren’s activities. Survivors include his loving wife of 62 years; children, Dean (Chris) Peterson, Alpha, Donna (Jay) Dahl, Orion; sister-in-law, Carole Life, Elkton, VA; 7 grandchildren and 11 great grandchildren; numerous nieces and nephews. He was preceded in death by his parents, 2 brothers, Glenn and Robert, sons, Richard, Michael and Chuck.